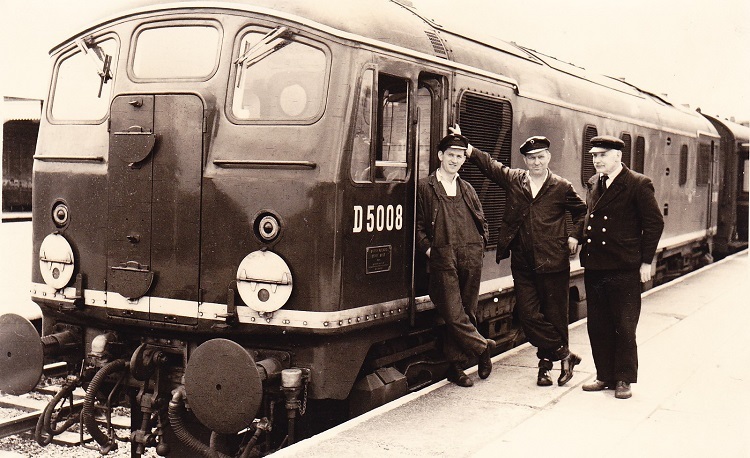 Photograph courtesy Geoff Dove Whilst on its BTC test run over the Midland mainline, the crew of D5008 pose for a portrait at Market Harborough. 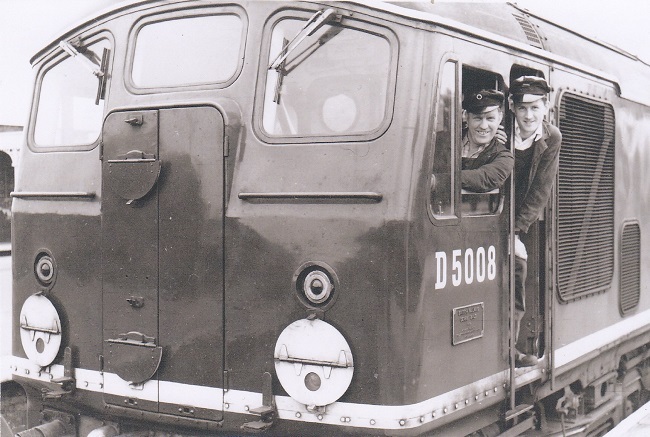 This is a Toton crew, to the left is fireman Geoff Dove, centre is driver George Bramwell and right is guard Francis Varley. The sixteen year four month career of D5008/24008 saw allocations to London Midland Region, Southern Region & Scottish Region depots. Full size fuel & water tanks (retained until withdrawn). Time between withdrawal & scrapping: 9 months. March 16th 1959 to Hither Green (73C) on loan. May 1959 to Crewe South (5B). May 1959 to Toton (18A) on loan (for test purposes). September 1959 to Derby (17A). October 1959 to Crewe South (5B). October 1959 to Camden (1B). January 1960 to Hither Green (73C) on loan. July 1962 to Camden (1B). September 1962 to Watford (1C). October 1962 to Carlisle Upperby (12B). December 1962 to Camden (1B). January 1963 to Crewe North (5A). September 1965 to Willesden (1A). January 1966 to Rugby (1F). January 1965 to Camden (1B). April 1967 to Stoke Division (D05). March 1971 to Eastfield (65A) on loan, made permanent April 1971. July 7th 1975 to unserviceable store. 24008 was stored at Cadder Yard from July 1975 to October 1975, then at Glasgow Works until February 18th 1976 when it was forwarded to Doncaster Work, being scrapped during May 1976. Noted Eastleigh Works July - August 1961. Noted Derby Works January, February, June, July & August 1963. Noted Derby Works May - July 1964. Noted Derby Works May & October 1966. Noted Crewe Works May 1968. Noted Glasgow Works October 1971. Noted Glasgow Works March - October 1974 (fire damage - continuous?). The frames for D5008 were laid down in the last quarter of 1958 with the locomotive entering traffic at the end of February. Although initially allocated to Crewe (5B) D5008 was immediately transferred to Derby and then almost as swiftly transferred to Hither Green (73C), part of a loan of fifteen Class 24s from the LMR to the Southern Region. At the end of April D5008 returned to Derby for a series of tests, being re-allocated to Toton (18A) for this purpose, D5017 replaced it on the Southern Region. This series of controlled mobile tests were conducted on a selection of the newly built diesel locomotive types to detail their performance and efficiency characteristics, these were conducted over a variety of speeds and power applications using the LMR Mobile Test Plant. The tests were to include a BR/Sulzer Type 2 with D5008 being chosen to participate. It had already completed 2,624 miles in service and would cover a further 4,211 miles during the tests. Photograph collection of A Stubbs. No date or location on this view for D5008 but it looks like Toton, taken during the period of BTC testing. There is some large writing on the fuel tank, a feature common to some of the early built Class 24s. The tests were undertaken during May & June by the Locomotive Testing Section, CM&EE Dept, LMR on behalf of the Locomotive Testing Joint Sub-Committee. To ensure the locomotive was a fair representative of its build it was subjected to static load tests on the Derby Locomotive Works test plant prior to the road testing. These initial tests revealed at the full controller setting the load regulated portion of the engine-generator characteristic was higher than the designed curve, attributable to the auxiliary power demand being lower than designed and that the engine output was high. No adjustment was made since the engine output was within prescribed tolerances. It was noted that due to the type of governor fitted there was a considerable rise in engine speed as unloading took place. Several days of road testing were carried out to determine the current-speed relationship of the traction motors in all fields, which would reveal if the values of the field divert resistances were correct. It was noted that variations in generator field temperature caused field diversion and unloading to occur at widely varying speeds, indicating that the values of the field divert resistance was somewhat excessive. This was brought to the attention of the manufacturers, no changes were made at this time due to certain practical difficulties. Following these preliminary tests a series of constant speed 'performance' tests were carried out on the Toton - Leicester - Rugby - Market Harborough - Derby - Toton route. Tests were carried out at seven different settings of the driver's controller, corresponding to nominal engine speeds of 330, 400, 450, 500, 550, 650 & 750rpm. The lowest speed of 330rpm is indicated by 'notch 1' on the controller, at this setting the diesel engine is unloaded throughout the range of road speed. Apart from notch 1 the power handle gives a stepless control of the power output, therefore the engine speed is infinitely variable between 330 & 750rpm. Where possible one of the above controller settings was employed throughout the whole of a particular test run. Each run was divided into ten or more sections of constant road speed, varying between five and ten minutes duration. Speeds were selected to cover the range at each controller setting in increments of 5mph. Over the lower speed range increments were increased by 2.5mph. Thus each test was carried out at constant road speed, controlled by the Mobile Test Units and at constant engine speed, imposed by the fixed controller setting. Because the auxiliary generator output was subject to variable demands from the two-speed radiator fan and intermittent operation of the compressor, its output was continuously recorded at the instrument desk. Readings on the locomotive itself covered systematic pressure & temperature readings of the fuel oil, lubricating oil, boost air, cooling water and engine exhaust circuits. A number of tests were also carried out with two of the traction motors isolated and the diesel engine running at full speed. Following completion of the constant speed tests a variable speed run was completed to demonstrate the practical application of the test results in normal service. This was made with coaching stock and dynamometer car totalling 560 tons. This load was chosen to give low balancing speeds on the steepest sections of the test route when working at full power. It would also demonstrate the capabilities of the locomotive in hauling a heavier passenger train than would normally be expected in regular service. The test was carried out over the Toton - Derby - Chesterfield - Edale - Chapel-en-le-Frith - Peak Forest - Ambergate - Butterley - Toton route. The performance information obtained from the constant speed tests was used to establish the timings for this run. The timings were based on full power output with the locomotive worked at full controller throughout, barring signal checks and permanent way slacks. Actual point to point timings were in close agreement with the calculated times. Two views of D5008 at Market Harborough, the top view is borrowed from the BTC report (photographer W H King), whilst the lower view shows driver Bramwell & fireman Dove (courtesy Geoff Dove). The tests with D5008 were carried out entirely according to plan, defects were only of a trivial nature and did not impact the operation of the locomotive. After the tests were completed D5008 was re-allocated back to Derby (17A) in October, then quickly on to Camden (1B) in November. 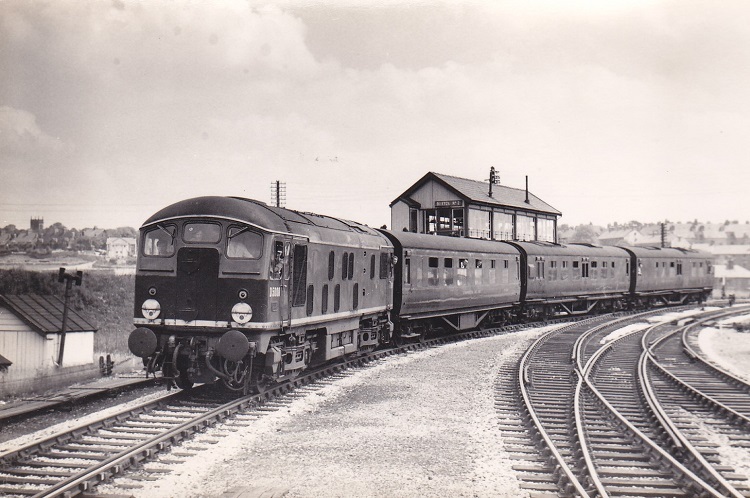 One interesting job for D5008, believed to be in 1959 was the working of a 'mobile test unit' over the Uttoxeter - Rocester - Buxton line, the section north of Rocester had closed to passenger traffic during November 1954. There cannot be too many Class 24's that worked over this picturesque route. Photographs courtesy Geoff Dove Two views of D5008 and test train in the Buxton area. The driver was Bill Towson, the fireman was Terry Redfeare. Condition September: green livery with frame level stripe, full size fuel & water tanks, no blanking plates, hand/footholds present, cantrail water filler cover present, ridge sided sandboxes, two-rung bogie mounted footsteps, four upper/four lower ventilators on non-BIS side, three upper/four lower ventilators on BIS side. The winter timetable commencing November 2nd found D5015/16/18/19 taking over some of the local workings out of Euston. D5017 was still on loan to the SR having covered for D5008 which had been at Toton earlier in the year for tests, though by November 4th D5008 had reached Willesden for empty coaching stock duties, working alongside Type 1s D8035 - D8038. D5008's stay at Camden was brief, it moved back to Hither Green (73C) in January. On August 9th Eastleigh Works hosted its annual Open Day, modern traction represented by D3667 & E5008 whilst D5008 & D5009 were under repair in the main workshops, D5008 had arrived at the Workshops during July. Condition August: green livery with frame level stripe, full size fuel & water tanks, no blanking plates, hand/footholds present, three upper/four lower ventilators on BIS side, no additional Southern Region disc brackets on No.1 cab. During 1962 the loaned Type 2s were able to return to the LMR D5008 to Camden (1B) in August. 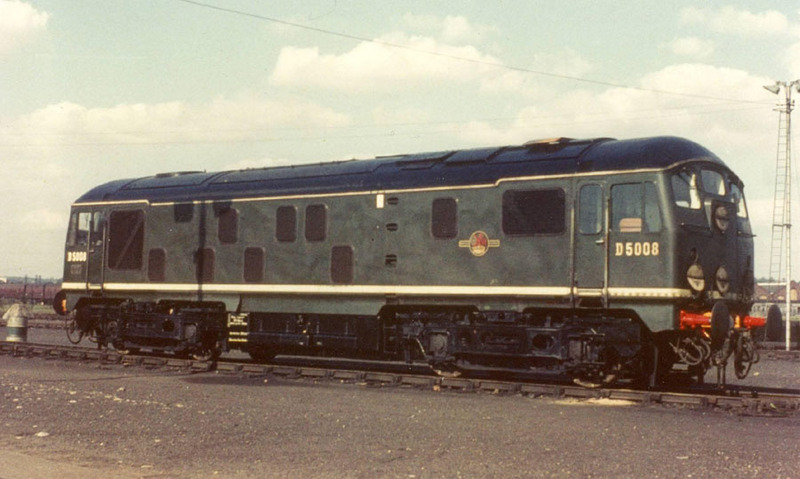 Despite its time on the Southern Region D5008 was never fitted with the additional brackets for disc or headboard use. During November D5008 was briefly allocated to Carlisle (12B) before returing to Camden in December. D5008 continued its wanderings, moving to Crewe (5A) in January before returning south to Willesden (1A) in September. After some five years as a diesel multiple unit working the 07.34 Lichfield - Birmingham and 17.45 return reverted to diesel haulage! On the first day of this diagram, January 26, D5008 worked both trips. D5008 moved to Rugby (1F) in January. During 1966 D5008 was noted at Derby Works during May & October. Possibly it had been called to Derby due to receiving minor collision damage to the No.1 end, specifically the driver's side sandbox and bogie mounted footsteps were heavily damaged, the cab handrails are missing and there appears to be a scrape on the cab sheeting. Condition date uncertain but 1966: green livery with small yellow warning panels, curved upper corners, full size fuel & water tanks, no blanking plates, hand/footholds present, ridge sided sandboxes, two-rung bogie mounted footsteps, engine exhaust located above engine room, three upper/four lower ventilators on BIS side. With the electrification virtually complete at the southern end of the WCML the duties of the Class 24s were increasingly replaced by the AM10s on the suburban passenger duties and the newly arriving Class 25s on the local freight and parcels workings. 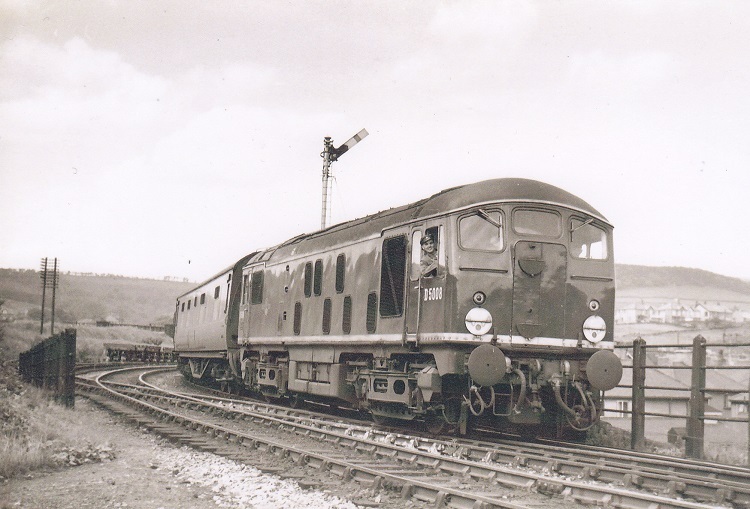 Thus all the Class 24s were eventually moved to the Stoke Division (D05) with D5008 moving northward in April. With a downturn in traffic and a surplus of Type 2s the LMR stored or withdrew a number of the first twenty Class 24s. However 5008 remained in service during this purge. In March as part of a large set of re-allocations 5008 moved to Eastfield (65A) being part of the scheme to allow the Scottish Region to withdrawn its few remaining Clayton & North British built locomotives. This was the last transfer for 5008. Condition March (?? ): blue/yellow livery, gangway doors sheeted over, headcode discs centered on cabfront, full size fuel & water tanks, circular gauge fitted to fuel tank, no blanking plates, hand/footsteps plated over, ridge sided sandboxes, three-rung bogie mounted footsteps, bodyside valencing removed. Wednesday, May 17th proved to be quite a day for mishaps on the Scottish Region. The day began with 5308 derailed at Burnhouse Weighs and 3384 going through the stop blocks at Mossend Yard. As 5008 was leaving Cadder Yard it came into a sidelong collision with 5375 running light. Five wagons hauled by 5008 were derailed, two containing scrap iron cascaded around the Class 27. 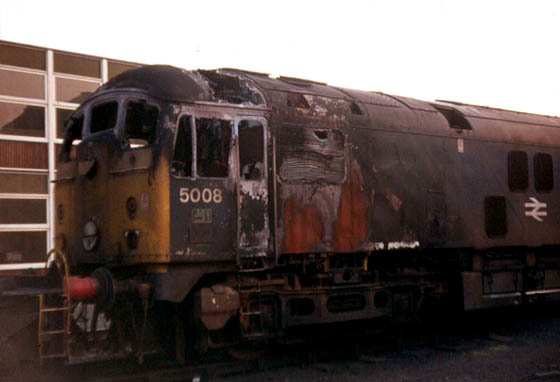 A rather scorched 5008 waits in Glasgow Works for attention on April 5th 1974. The Class 24s were not known to suffer seriously from traction motor fires, though this fire appears to have begun in the vicinity of the bogie, perhaps a traction motor fire or a fire started due to heavy braking igniting oil soaked debris on the bogies. Whatever the cause 5008 was fortunate to receive any type of serious repair, the end was near for the majority of the class. Condition April: blue/yellow livery, gangway doors sheeted over, headcode discs centered on cabfront (no SR headboard/disc brackets on either cab), full size fuel & water tanks, circular gauge fitted to fuel tank, blanking plates fitted, hand/footholds plated over, ridge sided sandboxes, three-rung bogie mounted footsteps, body side ventilators 4/4 non-BIS side & 3/4 BIS side. The summer of 1975 brought major reductions in the fleet of the operational Class 24s with the Scottish Region taking many out of service including 24008, being stored in July and withdrawn during August. On February 18th 24008/95/98 were moved from Glasgow Works to Doncaster Works for scrapping, by May 1976 24008 was no more. Condition final: blue/yellow livery, gangway doors sheeted over, headcode discs centered on cabfront (no SR headboard/disc brackets on either cab), full size fuel & water tanks, circular gauge fitted to fuel tank, blanking plates fitted, hand/footholds plated over, straight sided sandboxes, three-rung bogie mounted footsteps, body side ventilators 4/4 non-BIS side & 3/4 BIS side. Data from the BTC Testing report. Engine speed governor: Sulzer flyweight governor with stepless pneumatic speed control and hydraulic servo unit for operating fuel pump racks. Load regulator: oil powered vane motor driven rheostat in exciter separate field circuit. The Sulzer governor The governor is pneumatically linked to the drivers controller, movement of which increases the air pressure applied to a speed control cylinder in the governor. This actuates a valve admitting oil to a servo motor, which varies the load between idling (325-365 rpm) and 750rpm. A similar servo motor adjusts the position of the fuel racks to maintain the engine speed constant at the required value. Pressure-charging protection unit (PPU) This device incorporated in the governor was to prevent the engine from running continuously above the smoke limit. If the air supply becomes restricted excessive exhaust temperatures may result leading to damage to the turbo-charger or other engine components. The PPU would restrict the rate of fuel injection to a level appropriate to the charging air pressure, thus preventing the smoke limit being exceeded. It would also prevent the exhaust turning smoky due to turbo-charger lag, when the engine speeds up quicker than the turbo charger either at starting or when accelerating. For one test run the PPU was rendered inoperative to observe the exhaust as the diesel engine speeded up from idling. With the PPU operating only a faint trace of exhaust gases were permitted, when isolated exhaust gases upto a medium gray colour were observed - in both cases traces of carbon monoxide and hydrogen were detected. It was felt that under normal conditions the combustion did not deteriorate to the extent of requiring the fitting of the PPU. Engine Governor For the majority of the tests the original single fulcrum governor was used. However this was modified to incorporate a second fulcrum, an arrangement that would later become standard on the Type 2's. The fulcrum controls the rate of fuel rack position with engine speed. By adding a second fulcrum which only operates at low controller settings the BHP - RPM characteristic of the engine was depressed. This reduced the maximum value of the main generator current and therefore the starting tractive effort at the low controller settings, which allowed for a finer degree of control of the locomotive when starting. A number of tests were carried out using the modified arrangement. Horsepower Calculations One of the purposes of the tests was to establish power output of the locomotive at all stages. 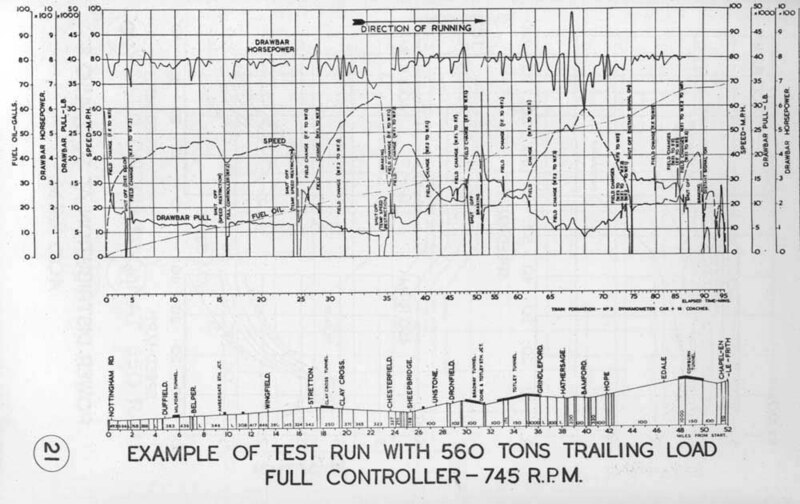 Using manufacturers data, information gained from the tests and taking into account certain variables it was possible to calculate the horsepower being delivered at various points from the engine itself to the drawbar. These calculations also revealed the losses created from the generator, auxiliary generator, other auxiliary equipment (parasitic losses), traction motors and the resistance of the locomotive itself. One of the more significant variables uncovered in the tests related to the combustion air drawn in by the engine. This was taken from air within the engine/generator compartment and variations in its temperature would considerably affect the horsepower produced - during the tests the temperature of this air varied from 78F to 120F. For the tests an average temperature of 100F was used, but using accepted figures for these engines the temperature variations recorded may influence horsepower by as much as 60hp. Using air for combustion above the ambient temperature would lead to lower engine output and higher fuel consumption. The option of drawing air from outside the locomotive would lead to an increase in weight through additional ducting, a more cluttered engine room which may itself lead to higher engine room temperatures! Another area that was affected by temperature fluctuations, in particular the rate of temperature increase, was the traction motor interpoles. This was of most importance when the locomotive was being worked in excess of its continuous rating. The traction motors were designed to handle excessive current for a short period of time, the heating of the motor to the limit of its Class B insulation specification was the scope of one of the tests undertaken - see table below. The optimum characteristics of a diesel electric locomotive would require full engine output over a wide range of road speed, high rail tractive effort at both maximum and continuous rating currents and all to be achieved at optimum fuel consumption. Of course these requirements conflict with each other, so a successful design is a satisfactory compromise of these factors. At full controller the diesel engine output was 1,165hp with intake air temperature at 100F, fuel consumption was 0.374 lb/bhp hour, giving a thermal efficiency of 34.9% Assuming standard air intake temperature of 85F the output became 1,182hp, within the permitted tolerance of +/- 60hp from the rated output of 1,160hp. Fuel consumption under these conditions was 0.368lb/bhp hour, compared to the makers guaranteed figure of 0.371. The average power absorbd by the auxiliaries ranged from 39hp at 500rpm to 45hp at 750rpm. At speeds below 500rpm the radiator fan and traction motor blowers were restricted to their lower speeds, auxiliary power consumption was reduced to 26hp. Generator efficiency at 500rpm between 15 & 50mph was 93.3%, motor efficiency 90.0% & transmission efficiency 83.9%. At 750rpm between 15 & 60mph the respective efficiencies were 93.7%, 91.4% & 85.7%. Locomotive resistance varied from 400lb at 10mph to 1,400lb at 80mph, the values obtained by calculating the difference between rail and drawbar horsepower and were confirmed by the results of coasting tests. These results were comparable to tests performed on other locomotives of similar size & weight. The drawbar horsepower at full controller was 920hp at 20mph, 843hp at 50mph and 587hp at 70mph, the respective efficiencies were 27.6%, 25.0% and 20.7%. At 500rpm the drawbar horsepower is 370hp at 10mph, 350hp at 30mph and 251hp at 50mph, respective efficiencies were 26.4%, 25.0% and 19.0%. 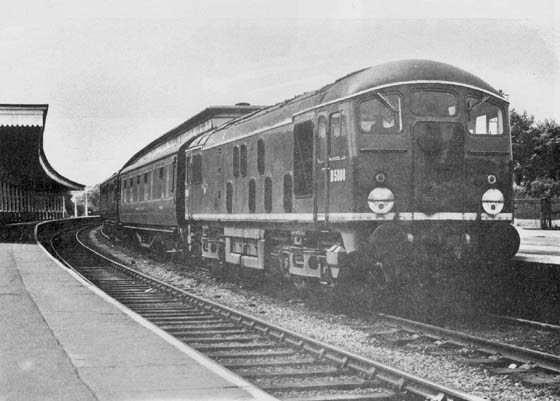 Much information on this page is obtained from Bulletin No 21, the British Transport Commission Performance & Efficiency tests with AEI-Sulzer Type 2 1160hp B-B Diesel Electric Locomotive Noi D5008. Photograph courtesy British Railways A view of the power unit similar to that fitted in D5008. Clearly visible is the belt driven exciter to the left of the view. 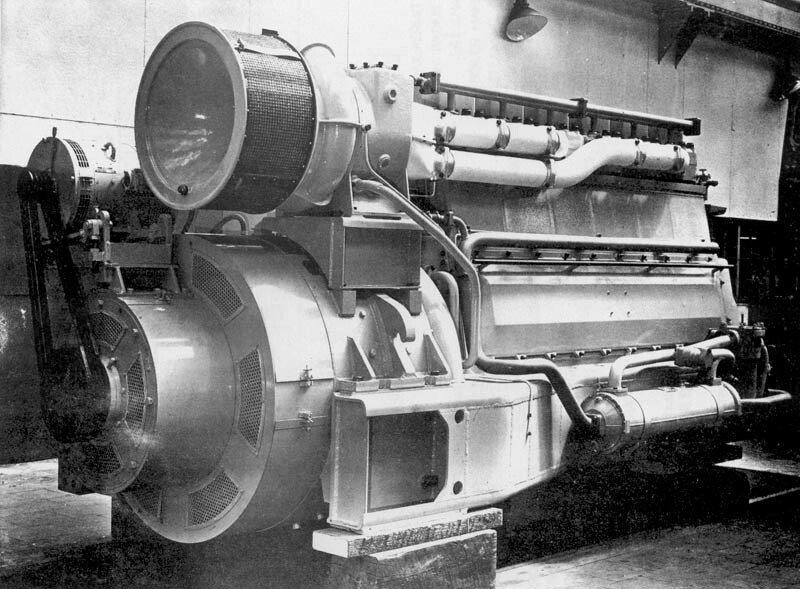 From D5050 the exciter was replaced by a decompounding winding in the main generator, producing similar characteristics as the exciter but allowing a certain weight saving. Photograph from the BTC test report. The report was filled with many tables and graphs, much of it way over my simple understanding of these things but this was perhaps the most interesting table. Page added January 30th 2004. Last updated February 5th 2019.